October 15, 2017 - by benign0 - 5 Comments. Blade Runner 2049 got rave reviews then “bombed” on its opening weekend. So what? I enjoyed it. The same thing pretty much happened to the original one in 1982 which took the slow road to cult classic status. Both are multilayered and sublime films. Even back in 1982, back when the youth of the time wielded far better concentration skills than today’s A.D.D. Generation, Blade Runner was not a universal hit. The film that director Ridley Scott envisioned did not have a voice-over narration. It was added at the insistence of studio executives who feared its subtle plot and thematic complexity would send it flying above the masses’ heads. The visuals in both Runners are stunning and this latest instalment owes the upgraded audience experience to today’s film-making technology but is still a tip of the hat to the groundbreaking creative vision and visual effects achievements of the original which had a lot less technology to work with. As with the original, Runner 2049 delved into the question of what it means to be human in a hypothetical world where the artificial is almost as good as the authentic. In the 21st Century, however, the hypothetical is no longer as hypothetical as it was back in 1982. Artificial intelligence has since become a mainstream topic of debate even in the non-techo community as business leaders and politicians ponder the future of the value of human labour in industry and national economies as machines get better at performing human tasks. 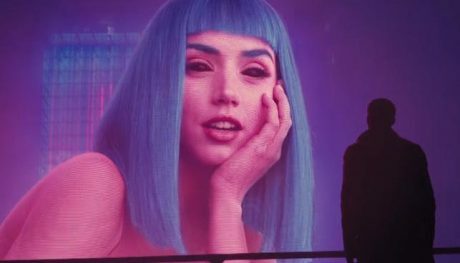 Particularly relevant to today’s technology consumers and a key emotional hook in 2049 is household AI in the form of LAPD blade runner Officer “Joe” K’s (played by Ryan Gosling) virtual girlfriend Joi (played by Ana de Armas). Joi is an AI represented by a holographic image of a stunning woman that interacts with Joe and, in the course of that interaction, develops a personality that Joe bonds with. Joi is a zenith in the evolution of human-machine bonding that had its dawn in 21st Century smartphones and progresses in today’s race to develop intelligent “digital assistants” into these. Joi is an imminent science fiction artefact as the technology already exists to create her. For that matter, she may already exist in machines that are, as of yet, not available to a mass market. Is Joi human? That iconic scene in 2049 shows her as an unboxed product exhibited in the form of a gigantic holographic image that interacts with passing pedestrians. As a product straight out of the box, the Joi in the street ad is clearly not human, just an objectified female form laying out scripted come-hither gestures and words through blank shark-like eyes. Most of us would be familiar with the challenge of upgrading to a new phone replacing one that years of use had evolved in it a configuration that fits our needs like a glove. 2049 draws on that modern-day challenge. The holographic Joi popping out of that street ad that briefly beckons Officer K as he walks by is but a shell of the Joi he had been coming home to presumably for a few years. Officer K’s Joi is clearly more human than the unboxed Joi exhibited in the holographic street ad. The question is, how good does a machine need to get at convincingly mimicking human behaviour and building relationships with “real” humans before they are consider, well, human? Like in 1982, Blade Runner 2049 does not fully answer that question, but it presents it to an audience to whom an answer had since become far more relevant. Blade Runner back in 1982 may have missed a bit of the mark as far as envisioning a future of flying cars and smog-choked megacities. 2049, on the other hand, seems spot-on in its vision of a future of personal AIs we are allowed to fall in love with. Artificial Intelligence (AI) is already here . They are testing Robots, who teach other Robots. They are in the form of : Robot soldiers, Robot Policemen/Policewomen , Robot drones, Robot servants, Robot prostitutes, Robot waiters and waitresses, Robot factory workers, etc.. The form of warfare will change dramatically in this century. Artificial Intelligence (AI) will play a great part in this development. Will they ever develop, a Robot Politician ?…this entity can really serve our country well. Surely, the Robot Politician will be programmed, and will not become a crook ! Hands down, the best movie of the year. nice article! I like these kind of topic compare to politics and cancers of society.